Quick & Easy 5-Ingredient Count Chocula Chip Cookies! 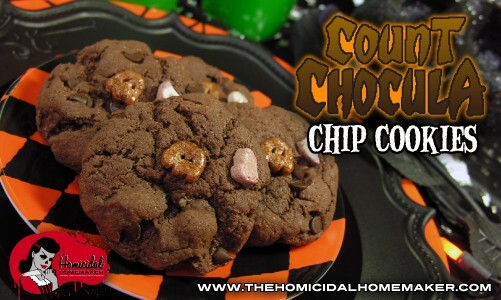 Sink your fangs into these super easy to make Count Chocula Chip cookies. They're made with only 5 ingredients, including a cake mix! Easy Count Chocula Chip Cookies…Using a Cake Mix! I’ll be honest – I have only made Cake Mix Cookies a total of three times in my life, and this recipe is included in those three. Now, before I developed this recipe, I never really thought about Cake Mix Cookies and how awesome they are. I mean, what’s not to love? They are low-cost, super-easy, and the combinations and possibilities of different flavors seems limitless! They are soft, chewy and moist, and practically fail-proof. But being that I always bake from scratch, they are often neglected from my baking. As mentioned before in my two previous Monster Cereal recipe posts for Yummy Mummy Fudge and Frankenberry Monster Chow, I was given the amazing opportunity by General Mills to try all five of their Monster Cereals, which included the newly-resurrected Fruity Yummy Mummy and Frute Brute cereals! Yay! In addition to creating a recipe for each of the Monsters, I wanted to make these recipes super easy and super low-cost, and then it dawned on me – COUNT CHOCULA CHIP COOKIES using a CAKE MIX! This recipe for my Count Chocula Chip Cookies is SUPER easy to whip up, uses only 5 ingredients, and takes only minutes to make! Empty cake mix into a large bowl. Add two eggs and 1/2 cup oil, and mix until combined (I used the dough-hook attachment of my mixer). Add mini chocolate chips and Count Chocula cereal, and mix with a spoon to combine. If the mixture is especially thick, gently knead the mixture with your hands. Drop by rounded tablespoonfuls onto a cookie sheet lines with parchment, and lightly flatten with the bottom of a drinking glass or back of spatular. Press one piece of Count Chocula Cereal and one marshmallow from the cereal onto the top of each cookie. Bake at 325 degrees for 10-12 minutes. Allow to cool on cookie sheet for 3 minutes before removing to cooling rack. Previous articleFrankenberry Monster Chow – A Sweet & Spooky Twist on a Classic! This really helped me with my sons party, thank you!